We get another Arrow crossover today as we see a villain from that show coming onto The Flash but I have to say the appearance of William Tockman aka the Clock King really added nothing to the plot. Tockman was basically a prison transfer that used the blackout (more on that later) to escape and holds Joe, Iris, Eddie and the rest of the Central City police force hostage. Tockman wanted revenge for being denied to see his dying sister in person. The main purpose of this storyline is that Iris held on hope that the Flash will come and save them but he doesn’t show up. And there is a reason why the Flash doesn’t show up to save the day and that is our meta human of the week: Farooq aka Blackout. I will refer to him as Farooq as he doesn’t gain the Blackout moniker by Cisco till episode’s end. Farooq received his powers 10 months ago when he was on top of a power tower then the particle accelerator exploded and he was struck by its electricity. When Farooq awakened, he discovered he electrocuted his two friends who had tried to give him CPR. Back to the present day, Wells enters his secret room and gets his future looking computer, Gideon, to open up his log. Wells narrates that Barry has started using his powers to accomplish everyday tasks and we see Barry, as usual running late, using his speed to brush and floss his teeth, speed up the coffee line and stop his own mugging. We also see Wells look at that future paper that we saw in the Pilot that stated the Flash has vanished. When Barry arrives at STAR Labs, Wells wants Barry to take his powers up a notch, that while commendable that Barry wants to use his powers to help people by stopping crime, Wells wants to study Barry’s powers to see how it can help cure things like paralysis. Barry is called away to a crime scene where they find a body that has been electrocuted and the body is unidentifiable. But thanks to some STAR Labs software, Cisco has managed to ID the body from the pictures Barry took. The man worked for Central City’s sub station and in fact the killer has used the man’s ID to enter the sub station. When Barry arrives there, he finds Farooq siphoning off the electricity. Farooq tells Barry he needs to feed off it to give him sustenance. When Farooq uses his powers to zap Barry, his speed starts to get sucked out of him and into Farooq. Barry feels drained while Farooq feels energized and wants more. Farooq gets more and when Team Flash tells him to run, Barry says he can’t. Back at STAR Labs and after a $65 Uber ride later where Barry told the driver he was coming from a cosplay party, we learn that Barry’s speed is gone. Caitlin doesn’t believe it but when we see Barry on the treadmill again, Cisco comments that he runs slower than a normal person. Wells goes back to his secret room and looks at the paper again and we see a different headline, one stating the demise of the US Postal Service. The future has changed. But trouble is a brewing as Farooq has arrived outside of STAR Labs looking for Wells as he blames him for what he has become and the death of his friends. When he calls for Wells go unanswered, Farooq starts to drain the power not only of STAR Labs but all of Central City. This allows Farooq to get into STAR Labs. This causes Team Flash to figure out a way to get the Flash back his powers. Barry muses with Caitlin that he misses his powers, misses being the Flash but mostly misses making a difference out there. Cisco and Wells have come up with a solution to jumpstart Barry’s powers again. They are going use the treadmill and hook up the generator’s power to it and turn it on to give Barry a big enough charge for his powers to return. But before they can do that, Barry first tries to talk some sense into Farooq. Alas it doesn’t work so Barry and Caitlin on the run from Farooq while Cisco sets up the generator. Meanwhile, Wells lets last week’s meta human of the week, Tony Woodward aka Girder out to kill Farooq. While Girder and Farooq fight it out, Barry is ready to get charged up again. Caitlin doesn’t want to flip the switch as she fears that this will kill Barry and doesn’t want to lose another person she cares about in STAR Labs again. If you are shipping SnowBarry then you must be loving this scene. Barry manages to convince Caitlin to flip the switch but alas Barry says it didn’t work. 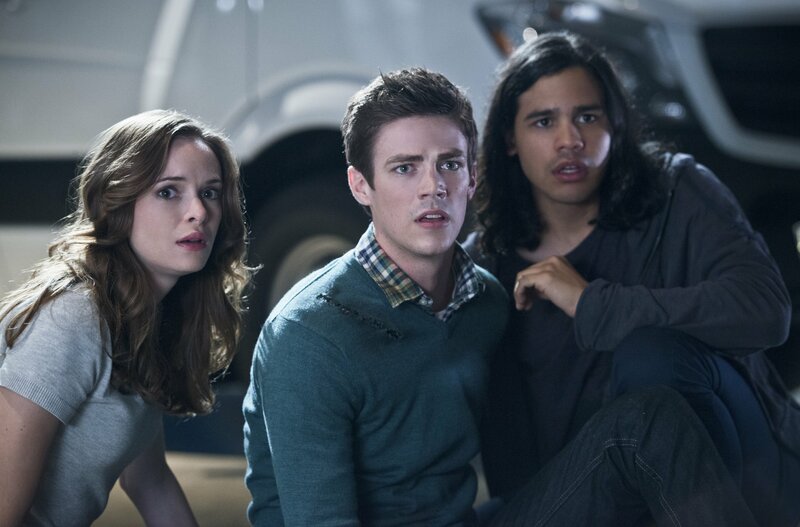 When Barry and Caitlin come across Girder, he has lost the battle with Farooq and dies. As Team Flash tries to make another break for it, Farooq finds them and is about to turn his electric power on Caitlin, Barry and Cisco when Wells tells him to go after him since he is his target anyways. Farooq blames Wells for what has happened to him and his friends and accuses Wells of not knowing their names. Wells does know their names and in fact spouts everyone that died the night of the particle accelerator, including Ronnie Raymond. When Farooq is about to zap Wells, seeing his mentor about to be fried, awakens Barry’s powers and he saves Wells. Farooq and the Flash go at for a bit and Farooq manages to zap the Flash again. Instead of draining his powers, it seems to overwhelm him and Farooq dies. Caitlin later tells Barry that Farooq choked on Barry’s powers and couldn’t handle it. Knowing that Iris was in danger from Tockman but not having his powers to save him, haunted Barry during this ordeal. As soon as he got his powers back, Barry speeded to police headquarters to see that Eddie has been gravely shot (but will be okay) and Iris, who managed to take down Tockman, and Joe safe. Oh and Joe doesn’t tell Barry about also seeing the man in the yellow suit. Back at STAR Labs, Barry apologizes for what he said to Wells. Wells tells Barry that while he doesn’t like people, he does care about Barry and cares about his future. Wells returns to his secret room and puts in a new entry in his journal that states that Barry attachment to people his what gives him strength and when we see that paper again, the original headline has appeared. The future is intact. When Barry goes to visit Eddie in the hospital, he brings flowers and Eddie is very high on drugs that he blames that on seeing Barry super speed to save the flower vase. Joe did that to test that Barry’s speed has returned while Iris was out getting coffee. And when Iris was getting that cup of joe, the Flash visits her to apologize for not being their save her and that he will always be on time for her. Iris says her best friend says the same thing. And I believe the Flash says something along the lines that Iris is worth being on time for or caring about or something along those lines. When Iris returns, we see that she is clearly smitten by that encounter that she forget her coffee. Barry notices this and is pleased that at least his alter ego has a romantic chance with Iris. I am not quite sure how that will work out if Barry intends on pursuing Iris as the Flash as opposed to himself. I think she would get pissed if she found out Barry and the Flash were one and the same. In the post credit scene, we see Wells take some of Farooq’s blood to learn why he can take away Barry’s powers. And when Wells took said blood, his face looked like he was up to no good. It is so interesting seeing Tom Cavanagh in this role after loving him at the loveable goofball Ed Stevens in Ed. To have Cavanagh play such an ambiguous character and having me not see him as Ed is truly amazing. The same goes for Grant Gustin. I think I’ve said this before but I couldn’t stand Gustin in Glee and didn’t know what to think of him being cast as the Flash but the moment I saw him on Arrow, I knew I would love him as Barry Allen. That is a true actor for you. But forget about that because next week we get the epic Arrow/The Flash cross-over event and from the preview we saw, it looks absolutely awesome.